he eulogies for the recently deceased John McCain, a US Senator for Arizona, have been plentiful, and so far as the American mainstream media is concerned, they have verged on the hagiographic. He has been variously described as a “patriot”, a “war hero” and a “defender of freedom”. Most perplexingly, McCain was lauded as a “warrior for peace”. But while praise for McCain has been dutifully administered in reverential terms by both liberal and conservative figures, the truth is that there is widespread dissent about McCain’s legacy as a man, as a military officer, as well as a politician. Perhaps, most worrisome is the construction of McCain’s legacy as one of the resolutely principled maverick and insatiable peace seeker. On the contrary, McCain operated at the highest echelons of the American Establishment, a closeted world of vested interests comprising a network geared towards the enrichment of the American elite. He was a captive of the defence industry and an unceasingly aggressive spokesperson for the post-Cold War era militarism that has compromised the United States and brought it down low in the eyes of the global community of nations. Each of these has doubtlessly played a part in the positive reviews of the life of John McCain since his passing. John Sidney McCain III was born into a family of naval servicemen, two of who reached the rank of admiral. He served as a naval aviator during the Vietnam War and later retired as a captain. McCain also engaged in a well-publicised, long-running feud with Donald Trump who as a polarising figure has succeeded in arraigning different strands of his countrymen against his presidency. His demise, caused by the effects of a malignant brain tumour, was a cruel one. Glioblastoma is the most aggressive form of cancer. McCain is claimed by some to have done this and that the ensuing concatenation of maladies are traceable to his reckless act. That he avoided the consequences of his actions is said to be due to the seniority and influence of his high-ranking father who some, including Admiral Thomas Moorer, a former Chief of Naval Operations and Chairman of the Joint Chiefs of Staff, allege was at the time cooperating with the cover-up pertaining to the deliberate attack on the USS Liberty by the armed forces of the state of Israel, which had occurred the previous month. Three months later, McCain was shot down while conducting a bombing sortie over North Vietnam. No official blame has ever been attached to McCain for his shooting down. But as his aircraft was lost behind enemy lines, its remains were not subjected to the same sort of forensic analysis as had occurred after the earlier mishaps while in control of the cockpit. In all three incidents, McCain’s skill and judgement had been called into question. And while they allow that McCain refused an offer of early repatriation unless all prisoners were released, some allege that he was given special treatment with two other ‘defectors’ for cooperating. In fact, they argue that McCain’s refusal was an easy one given that he knew that his future prospects in the military and any public office would have been ruined. Many veterans claimed that those who were granted early release in three sets of releases in 1968 were collaborators who they dubbed ‘the slipperies’, ‘the slimies’ and ‘the sleazies’, and that McCain had acknowledged this. As a new senator in the early 1990s, McCain was involved in a corruption scandal after he and four senators from the Democratic Party were accused of trying to intimidate regulators on behalf of a campaign donor who was eventually imprisoned for corrupt management practices. He escaped with a reprimand for having “exercised poor judgement”, but with the accompanying judgement that his actions “were not improper”. In August 2006, McCain was captured in a photograph going onboard a luxury yacht rented by the Italian con-man Raffaello Follieri in Montenegro. It was here that McCain met the Russian oligarch Oleg Deripaska for a second time, after an initial meeting in Davos. Both meetings had been arranged by Rick Davis, who like Paul Manafort has been a long-time conduit between American big shots and the Russian ultra-rich. Nathaniel Rothschild, who has large business interests in Montenegro, a country that granted him citizenship in 2013, also met with McCain. McCain, who wielded a great deal of power as a long-term senator, allegedly chaired an important CIA meeting in Cairo that was pivotal in fomenting the so-called Arab Spring. And just as he met with political extremists in Kiev prior to the US-backed coup, in 2011 he was seen walking the streets of Benghazi where he was photographed meeting anti-Gaddafi rebels who embraced the Islamist creed of al-Qaeda, the alleged perpetrators of the September 11th attacks on the United States. He called the rebels “heroic” and lobbied for US military intervention weeks before NATO began its bombardment and training of the al-Qaeda-affiliated Libyan Islamic Fighting Force (LIFG). And given his vocal support for overthrowing the government of Gaddafi and his ‘fact-finding’ tour, he was also likely to have been influential in paving the way for President Barack Obama’s decision to authorise the use of predator drones. McCain would later be pictured with Senators Lindsey Graham and Richard Blumenthal giving an award to Abdel Hakim Belhaj, the leader of the now disbanded LIFG. 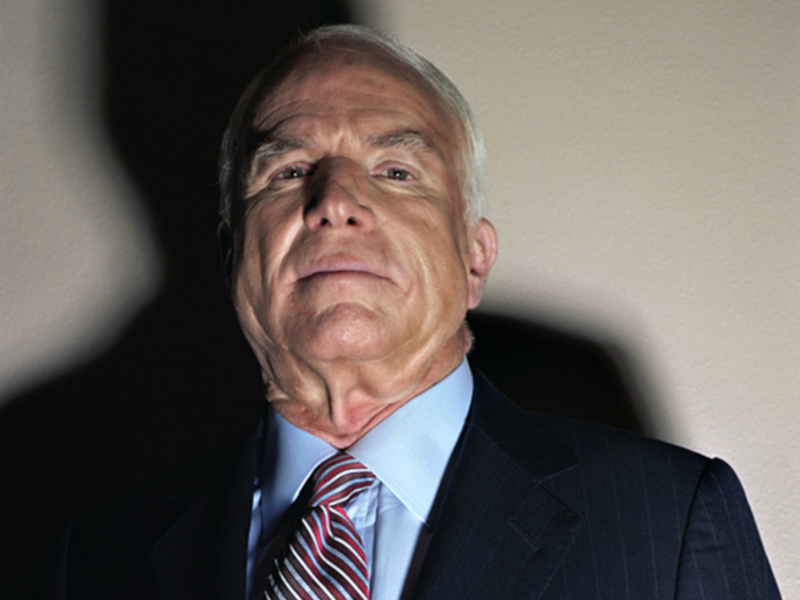 McCain was despite his maverick label an establishment man adept at manoeuvring between the public spotlight and the shadowy, largely unseen world of what many now understand to be the ‘Deep State’. He was almost certainly a key player in the machinations of America’s ‘double government’ and its formulation of national security policy which, as Professor Michael Glennon pointed out in a lengthy research paper, has essentially remained unchanged from successive administrations starting with George W. Bush, through to the one headed by Barack Obama, and now that of Donald Trump.